GENEVA--(BUSINESS WIRE)-- Selexis SA today announced that the Swiss Biotech Association (SBA) has named Selexis to an esteemed group of five Swiss Biotech Success Stories, as determined by a jury of industry experts, based upon the company’s contributions to the biotechnology industry in Switzerland. 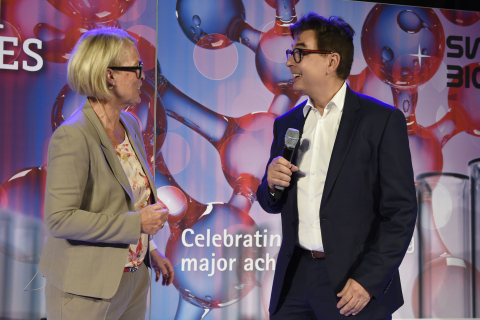 The organization celebrated the inaugural group of honorees at a special event held on May 3, 2018, during Switzerland’s leading biotechnology conference – the Swiss Biotech Day. Selexis was selected by SBA jurors for meeting SBA-determined “success categories.” Specifically, Selexis was recognized for: new technology; product approval and sustainable revenues; important intellectual property, innovative deal-making, acquisition; involvement of one or more Swiss citizen; Swiss-based company/institution; creation of jobs in Switzerland; enabler for the biotech industry; and Swissness: think global, made in Switzerland. According to SBA, a jury of distinguished experts who observe the biotech industry from different perspectives determine selection based on significant achievements and admission to the Swiss Biotech hall of fame for multiple and sustainable successes. Biogen, Glycart, Okairos and Vifor Fresenius Medical Care Renal Pharma were also named 2018 Swiss Biotech Success Stories. Founded in 1998, the Swiss Biotech Association represents the interests of the Swiss biotech industry. To support its members in a competitive market, the Swiss Biotech Association works to secure favorable framework conditions and facilitate access to talents, novel technologies and financial resources. To strengthen and promote the Swiss biotech industry, the Swiss Biotech Association collaborates with numerous partners and life science clusters globally under the brand Swiss Biotech™. For further information see www.swissbiotech.org. Selexis SA is a pioneering life sciences company and a global leader in mammalian (suspension-adapted CHO-K1) cell line generation, providing unparalleled proprietary technology and the highly-specialized expertise that is necessary to translate scientific innovation into life-saving medicines for patients. Selexis’ SUREtechnology Platform™ facilitates the rapid, stable, and cost-effective production of virtually any recombinant protein and provides seamless integration of the bioproduction continuum, spanning discovery to commercialization. With more than 100 partners worldwide, 100+ drug products in clinical development and three commercial products utilizing Selexis-generated cell lines, the Company has a history of empowering scientists and biopharmaceutical companies around the world to realize the full potential of their research. More information is available at www.selexis.com.